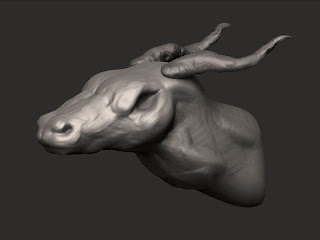 I went to my first Zbrush class the other night at 3DTA. I definitely enjoyed it. We had roughly half an hour of sculpting time to mess around with a dragon head so I thought I would post mine. Once I started to get the hang of navigating I actually made a little progress. Not bad for a beginning, although I think it looks more like an antelope right now..